I was attempting to adjust the bridge when the worst thing happened. I first loosened the strings just a tad, then the G string a little more. I was able to move the bridge so that it was centered when looking from above, after which I attempted to re-tension all of the strings. I was taking my time, but when applying tension to the G string, I heard a little pop and the ball end came loose. I then backed off the G string, reinserted the ball end, but this time while applying tension (not a lot - I was going slow), the string broke, this time from the peg box end. 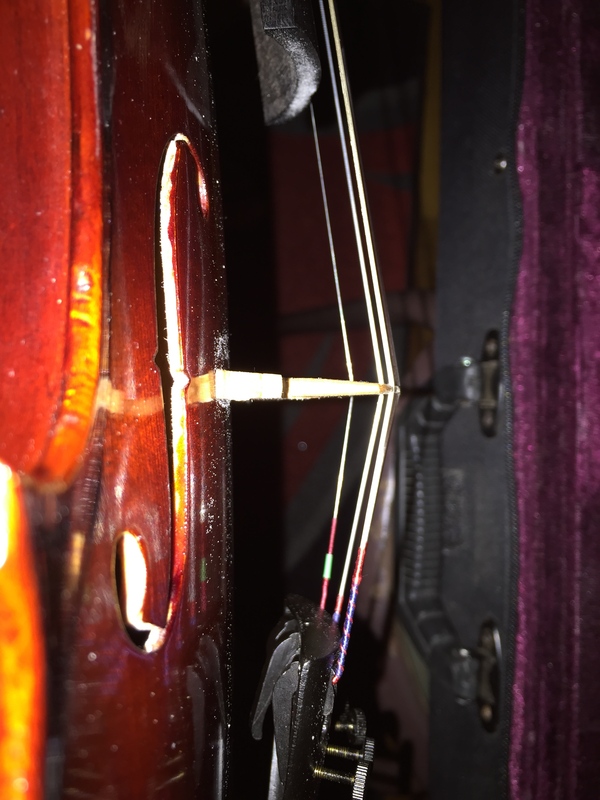 I freaked out a little bit, as this was the first time a string broke, but I remembered that this was a used violin and the strings were also used. I don't know when they were last changed, so I decided to re-string my violin. I got a set of D'addario Pro-Arté strings locally and was able to re-string my violin with no problems, thanks to the video @Fiddlerman posted. Thanks for that Pierre It was actually a lot easier than I expected, but I appreciate the directions on which side of the string hole to wrap the string as it is being tensioned. Unfortunately, for me, my playing does not yet sound any better with the new strings but I'll be working on that. I've attached some pictures primarily of the bridge. I think it needs to be adjusted slightly more towards the tailpiece and would like y'all's opinions on that, if you don't mind. I'm keeping the old D, A, and E strings as backups, just in case, but I like the sound from the new strings. I included one pic of my violin in its case to show my chin rest. I was told it's rosewood, but the first pic I took made it look like it was boxwood (it was much lighter). This time, I didn't use as much light in the room as before, and the color looks more like it does "in real life." I'm going to leave the fittings as they are for now and concentrate on my playing. I'll revisit the fittings possibility when I actually sound good. 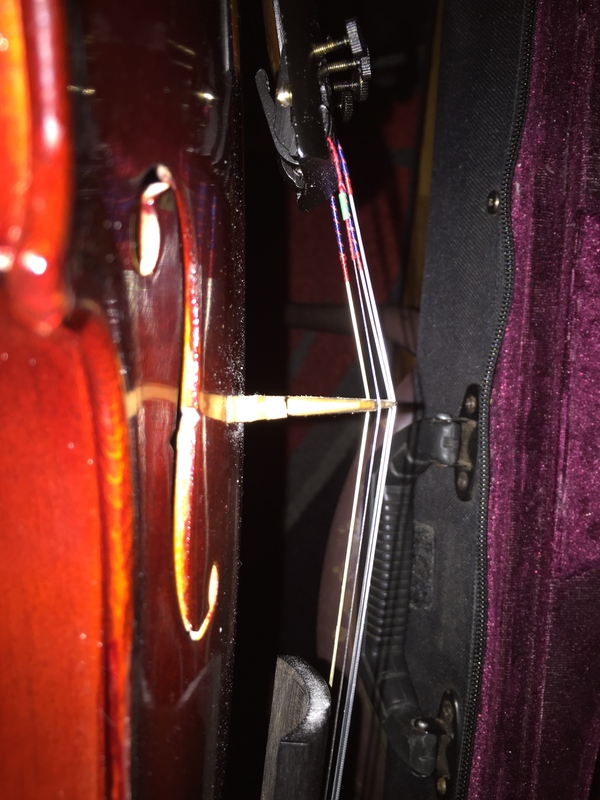 @iBud: Your bridge location looks to be OK, but your strings are wound on top, not each string touching the peg. If you find that the string is too long you can cut about 1" off to make it wind better on the peg. Overlapping the strings will give you problems keeping the violin in tune. Think of a fishing reel and the level wind and how the level wind keeps the line straight and not overlapping. 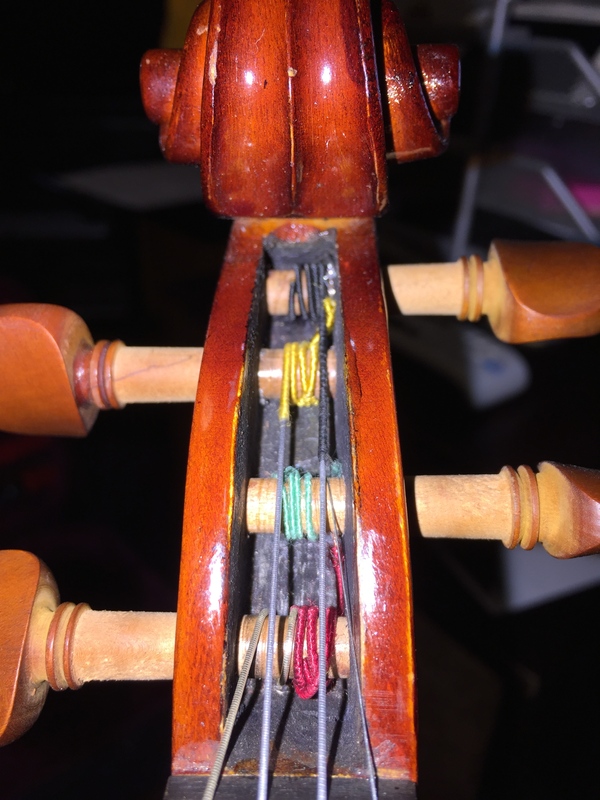 Overlapping the strings can cause early wear in the peg box and also cause breakage. Congrats on the stringing and setting up the bridge. I'll leave the technical stuff to the others. Pretty violin. I also used those strings for a year or more and love them. Lovely G string sound with ProArte. I was confused, initially when you mentioned overlapping, but I think I have it now. Thank you for the tip, vis á vis cutting off excess so that the string itself windows around the peg. You mentioned cutting of 1" - how much of the wound part is actually needed? I was looking at your bridge, you say it needs to be moved back towards the tail piece a bit,,, in further looking I do agree but only the top, it seems to be slightly tilted forward a bit. 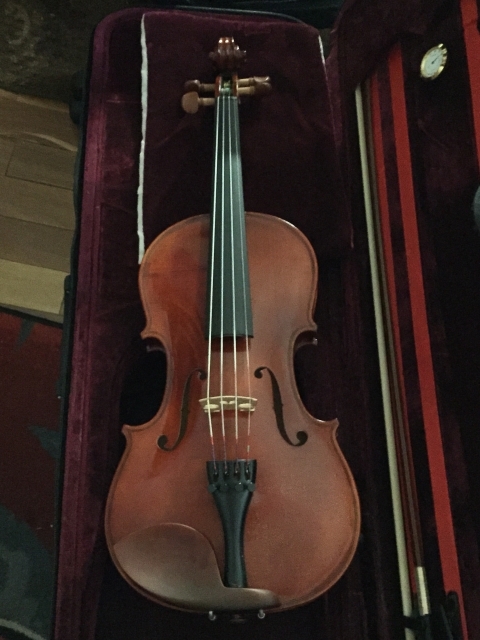 As far as location on the belly of the violin that looks ok. From the photo it appears to be slightly bent, but this could just be the camera angle. If you start moving the bridge all over the top of the violin then you'll more than likely contend with moving the sound post. Be sure your sound post is standing straight and vertical in both directions, sided to side and front to back. Sound posts are usually put in using a setter that is pointed and very sharp on one end. The setter is jabbed into the SP so that the grain of the post is cross ways to the grain on the violin top. Be sure you can see the mark near the top of the post where the tool was poked in, that mark should be 90° to the grain on top. Sound posts are a very crucial part of the violin and how they sound. Location is everything. Thanks for your responses. I was torn between D'addorio's Helicore and Pro-Arté string sets. 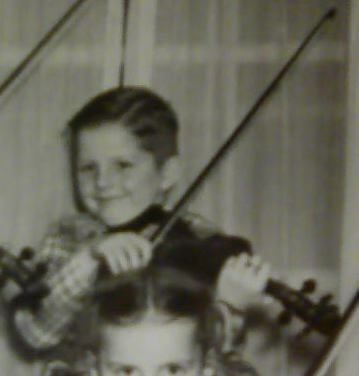 At this point, my ability doesn't warrant the better strings, but I may get Helicore or Thomastik Dymanics in the future. I was unable to get a good picture of the sound post, what with it being inside and my iPhone's camera wanting to focus on the belly instead of the sound post. I then got creative. As I've recently received my iPhone 6 Plus, my wife has taken my former iPhone 5. Both of them have iOS 8, so they have the Flashlight feature. I was able to use the iPhone 5's flashlight to get enough light on the sound posts to take a good picture with my iPhone 6 Plus! I've attached those pics. I think the sound post is in a good position, but I would appreciate a second opinion. The pic from the left side has the bass board a little in the way, but it's the best i could get. Taking another look at those pics, I was shocked at how much rosin is on the belly. When you look at my fiddle, there doesn't appear to be that much. I'll have to pay closer attention to that in the future. As for the strings, it looks like my D and A strings are a little too long. I'll cut off the excess until I get the string wrapping around the pegs. I restrung the G string and cut off a little over an inch on the D string and restrung it as well. I still have a bit of length on both the D and A strings, but I don't think anything is overlapped this time. Please take a look and let me know what you think, with respect to overlapping. Wow, I just realized that I'll have to restring my G and A strings again. I tried to follow @Fiddlerman in the video, but the first wrap should be on the inside, not the outside. I'll get right on that. Good job... Love your pics. @iBud: Don''t cut anymore off the strings, you've cut enough. Just take more care on wrapping the strings closer together. Unless my eyes deceive me, it appears the bridge has been cut in reverse. Looks like the angled side of the bridge is to the tail piece. The flat side of the bridge should be facing the fingerboard. I may be wrong though. The sound post looks good but the bridge needs to be slid forward just a tad bit more so the f-hole nitch centers the bridge feet. Here is an example of what it should look like in the peg box. Thanks for all the feedback. You've been extremely helpful. It looks better. Glad I could help. May I volunteer for that position? In all seriousness, I can easily give you some hands on education, it's an easy thing to do. I'll even use my cheapo Chinese violin for your practice instrument to learn how to string it up without fear of hurting your "soloist". Ha ha. I will try to pick out a couple gold type e strings. And I will ask you help me hear different qualities.